Following on from some major upsets in the 2013 Davis Cup World Group, we take a look at some of the biggest Davis Cup upsets in recent history. Tennis players are used to playing for themselves. Therefore, representing their country and playing for their teammates adds a whole new layer of pressure than what they’re used to. It’s why Davis Cup frequently throws up such unusual results, and sees some players at a standard play well above their ranking, or alternatively, well below it. Today, we take a look at some of the biggest Davis Cup upsets in recent history. Israel hosted a star-studded Russian line-up that included Marat Safin and Mikhail Youzhny, but even the Russians weren’t immune to the massive home-court advantage the Israeli team had in front of their boisterous fans. World No.210 Harol Levy shone in his defeat of 24th-ranked Igor Andreev, as did Dudi Sela in beating Youzhny. When Jonathan Erlich and Andy Ram beat Safin and Igor Kunitsyn in the doubles, the 3-0 lead confirmed Israel’s progression to the semis for the first time ever. Slightly undermanned, Switzerland travelled to France with just two players – No.17 Hlasek and No.59 Rosset – representing the team against a French outfit boasting the doubles line-up of Guy Forget and Henri Laconte. 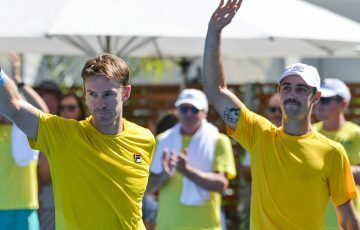 But singles players Arnaud Boetsch and Thierry Champion (each ranked around the 50-mark) were outdone by the Swiss, and although Forget and Laconte were able to win the doubles, Hlasek wrapped up victory in the first reverse singles rubber over Champion. It was always going to be a tough task for the Aussies to travel to France, play on clay, and defeat the hosts in front of a vocal home crowd. And with the tie poised at 1-1 after the opening day and the Woodies falling in a hole early in the doubles rubber, it looked even less likely. 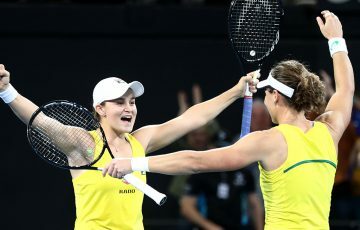 But the pair rebounded to win in four over Olivier Delaitre and Fabrice Santoro, and when Mark Philippoussis returned on the final day to clinch the first of the reverse singles matches, Australia had cemented a famous, and improbable, triumph. A solid if little-known Italian unit of Gianluca Pozzi, Andrea Gaudenzi, Davide Sanguinetti and Diego Nargiso travelled to the US to play a team lead by top-tenner Todd Martin, on indoor hardcourt no less – not the preferred surface of Italian players on tour. But the visitors thoroughly outclassed the hosts, racing to a 4-0 lead before Jan-Michael Gambill claimed the US’s solitary point in a dead singles rubber. Italy progressed to its first final since 1980. 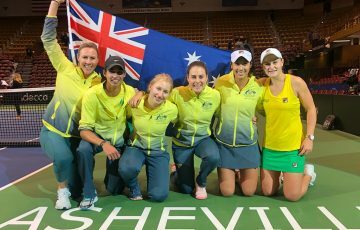 During their winning run of 1999, the Aussies took on the experienced powerhouse US team, where a young Lleyton Hewitt, just 18 and then ranked No.32, upset eighth-ranked Todd Martin in his Davis Cup debut. As the US created a media circus around whether world No.1 Pete Sampras would replace Martin in the reverse singles, Martin was ultimately ordered to play Pat Rafter, who fell behind two-sets-to-love and points for a break in the third. 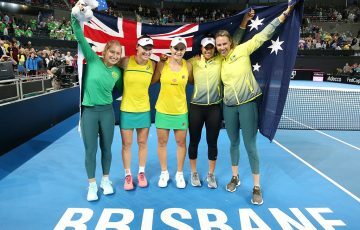 Yet the Queenslander staged a stunning rally and knocked off the American in five, cementing a 3-1 lead for the visitors in the centenary of the competition. The Croatian line-up paled in comparison to the star-studded American team of Andy Roddick, Andre Agassi and the Bryan Brothers. Played on Californian hardcourts, the tie appeared a gimme for the US. Not so. Going 1-1 on the opening day, singles players Ivan Ljubicic and Mario Ancic added to their heavy workload by combining in the doubles, and stunned the Bryans in four sets. When Ljubicic returned to beat Roddick in five in the reverse singles, Croatia had scored a famous upset win, and went on to win the cup later that year. In its first ever World Group tie, fledgling Davis Cup nation Kazakhstan staged one of the greatest coups when it beat the Tomas Berdych-lead Czechs. After Berdych won his singles rubber and combined with Lukas Dlouhy in doubles to give the hosts a 2-1 lead, they watched in horror as Andrey Golubev (over Berdych) and Mikhail Kukushkin roared back in the reverse singles to complete a stunning upset. Fast forward to 2013 – the Czechs are now the reigning Davis Cup champs while none of the four members of that 2011 Kazakh side are ranked inside the top 150. 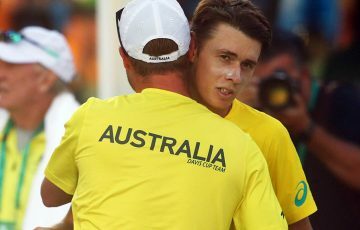 Australia fronted up in Brazil and promptly fell behind 1-0 when Pat Rafter had to retire from the opening singles rubber. Thank goodness for Lleyton Hewitt, who won his singles match and then combined with a recovered Rafter to claim the doubles. But it was Hewitt’s heroics in the reverse singles – where he took on two-time reigning French Open winner Gustavo Kuerten in the Brazilian’s hometown and on Guga’s favourite clay surface (while being Hewitt’s least productive) – that will go down in history. 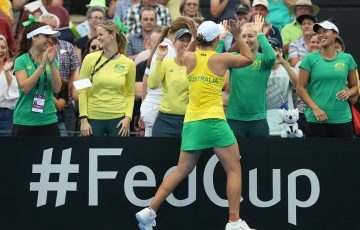 The Aussie clinched a remarkable straight-set win to hand the visitors a 3-1 victory. Playing on grass in Mildura, Australia was expected to make mince-meat of a Zimbabwean team in its first ever appearance in the World Group and represented only by brothers Wayne and Byron Black. Yet the Blacks produced inspired performances in the reverse singles to shock the nation; Wayne bested Mark Woodforde before Byron clinched the decisive rubber over Jason Stoltenberg. The win was all the more remarkable given Australia went on to win the Davis Cup the very next year, while Zimbabwe were soon relegated and have never been back in the elite group since. Coming into the 2013 competition, Spain had won three of the past five Davis Cups, while Canada had only re-entered the World Group a year earlier after being outside the elite group since 2004. Despite Spain missing top players Nadal, Ferrer and Almagro, the Spanish team was still far stronger on paper than the hosts. 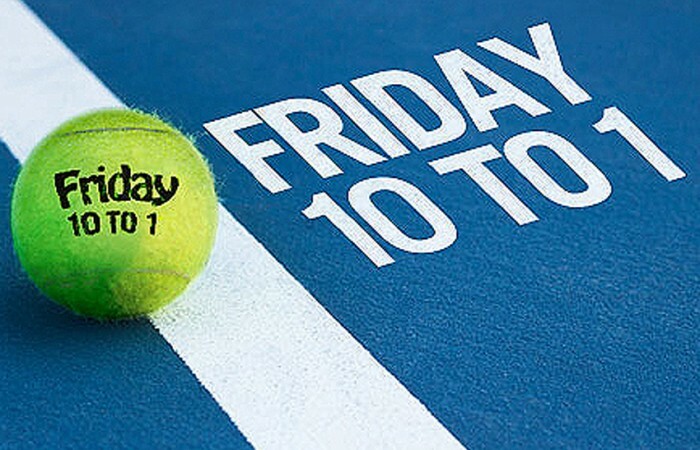 Yet watching Frank Dancevic – ranked 166th at the time – pulverise the 34th-ranked Granollers was jaw-dropping (first video), and when Milos Raonic finished the job in the fourth rubber (second video), Canada had handed the top-seeded Spaniards their first opening round loss since 2006.